I was helping my daughter pack for camp, when all of a sudden, I noticed that she nearly met me eye to eye as we stood facing one another. She often jokes that she is taller than me, her giggles rising along with her tip-toes to gain a few more inches as she tries to prove her point. While I still have her beat, it’s honestly not by much, and I know that any day now, she’ll win at this game. But this business about camp – well, that’s where the reality really sank in. Her first sleep away camp – a full week! – brought with it loads of excitement, perhaps a little apprehension, and the realization that she is getting older. I admit that I was more excited for her than anything, because I have such fond memories of summers away at camp and the adventures I had. Her first night away, however, I couldn’t believe how much I wanted to check in on her. For the first time ever, I couldn’t simply text a parent or chaperone and see if all was well. Seven days and six nights without knowing – it’s a little weird, I have to admit! The morning after she left for camp, I set out to make waffles for breakfast and felt the quiet in the house. I actually felt a little guilty making something chocolatey and decadent without her! But I knew that my little guy (who let’s face it, is not so little anymore either) was looking forward to Sunday waffles, whether his big sister was home or not. 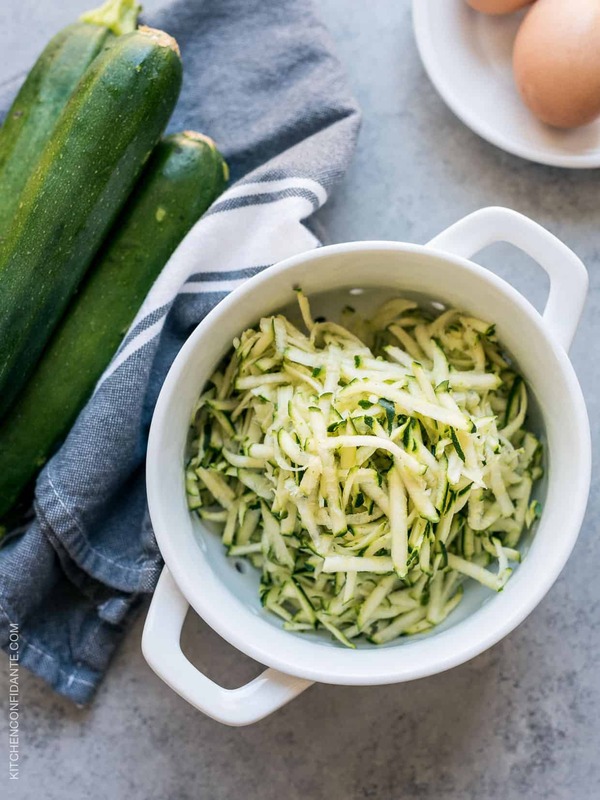 I grabbed a couple of zucchinis and started grating – summer squash season is here, and if you know anything about me, you just know that I have this thing for baking with them and turning them into sweet treats. Bonus points if there’s chocolate involved. 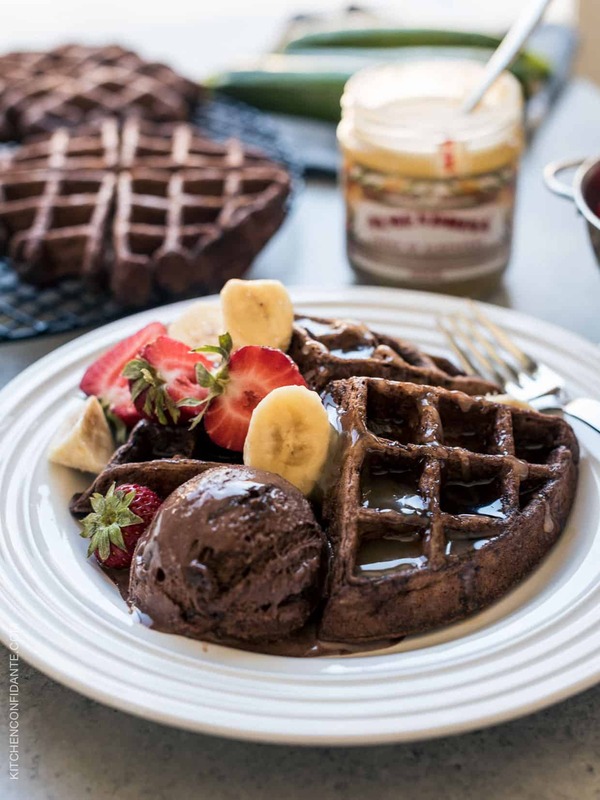 This recipe for Chocolate Zucchini Belgian Waffles continues my chocolate and zucchini obsession and I leave it up to you to decide if you will eat it for breakfast or as a decadent dessert. Straight from the waffle iron and onto the breakfast table, you’ll love it smothered with some maple syrup! I had a special treat from our friends who returned from their trip to Spain — a jar of Almendrina — an incredible almond cream that was insanely good with the waffles. As if that wasn’t enough, I took it a step further, and you know what? You’ve also got to try the waffles with a scoop of chocolate fudge ice cream, bananas and syrup (or almond cream!) as the ultimate dessert. Between you and me, that is how I love it best. My daughter is back — can you guess what I will be making to welcome her home? Take one chocolatey guess! Here’s hoping it beats camp food! Preheat the waffle iron. 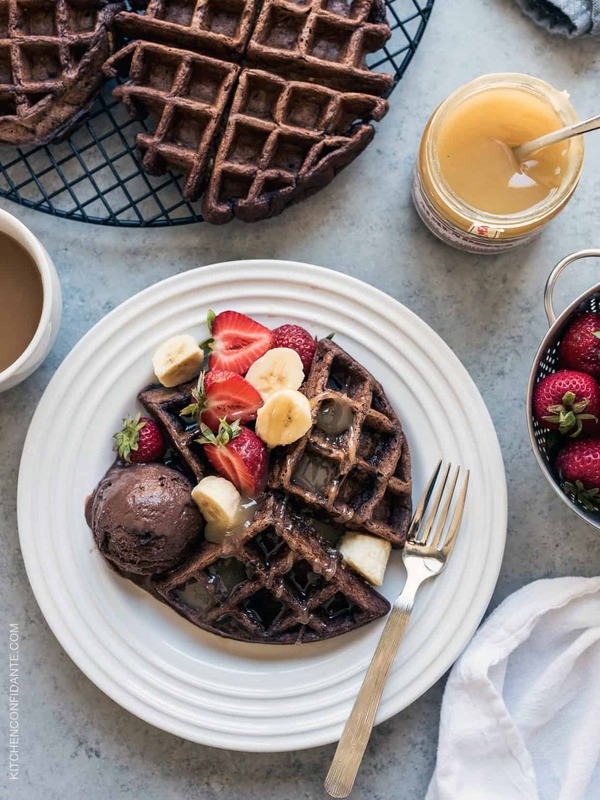 If you will not be serving the waffles immediately, preheat the oven to 175 degrees F and place an oven proof metal cooling rack in the center of the oven. 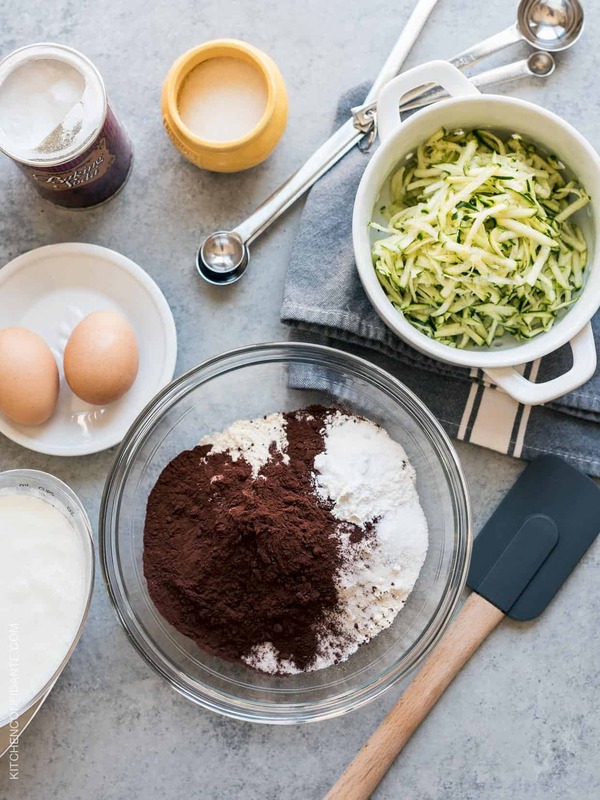 In a large bowl, whisk together the flour, cocoa powder, sugar, baking powder, baking soda, and salt. In a smaller bowl, whisk the buttermilk, melted butter, and eggs. Stir the zucchini into the buttermilk mixture. Add the buttermilk mixture to the flour mixture, stirring until just combined; do not overmix; a few lumps are ok. 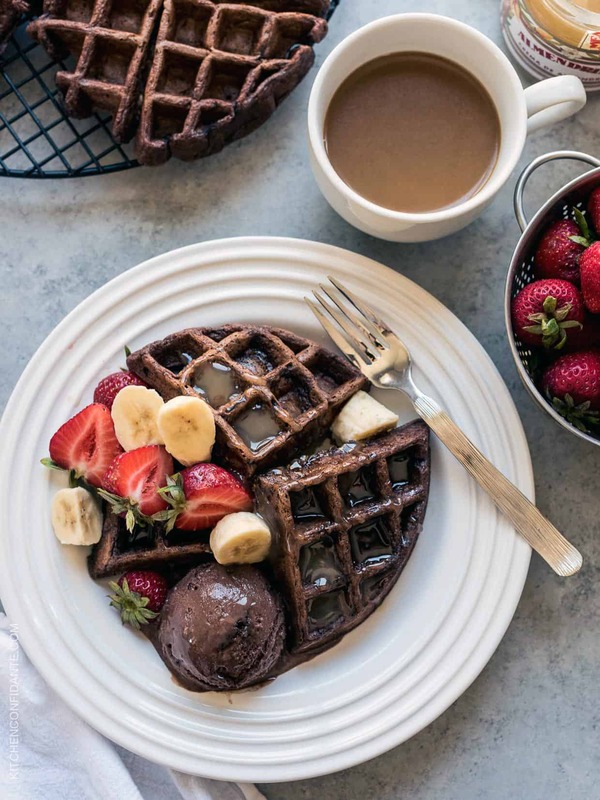 When the waffle iron is ready, pour the batter in the waffle maker (about 1/2 cup per waffle, depending on the size of your waffle mold), and bake for 3 minutes. Transfer the waffles to the prepared metal cooling rack (be sure not to stack waffles as this will make it soggy) in the oven until serving, or serve immediately. Enjoy with fruit, syrup and if you’re feeling especially indulgent a scoop of ice cream.